We are one of the eminent manufacturers of Slim Standard MPU Concept, which are suitable for monitor control and multi-unit-system application requirements. 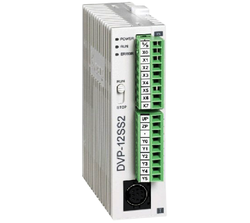 It is highly compatible with various brands and support Modbus protocol. Clients appreciate this product for its flexible extension which provides 10khz pulse output. Moreover, this series of product is built in with 4K steps program memory and 30KHz high speed counter. Looking for PLC Slim Series Systems ?